For an introduction see Getting Started below. The Community Software Repository (CSR) enables research cyberinfrastructure (CI) users to discover operational software on XSEDE resources, campus resources, thru science gateways, and from other infrastructure operators. The CSR also enables CI operators and developers to discover packaged software they can install for their users, or for their own use. From these pages software providers (developers, integrators, and operators) can manually register the software they make available to software users and consumers. For providers that have software catalogs and want to automatically register from those catalogs instead of manually, XSEDE provides the Information Publishing Framework (IPF) software. New software providers can e-mailing help@xsede.org and request "CSR Software Registration Access". Packaged Software which must be provisioned or installed before it can be used, and may be distributed in any form, including source tar, vendor package, build recipes, VM image, container, etc. Operational Software and Services which are ready-to-use, and are typically accessed from the command line, thru an execution environment, or as a remote network service. So that users can discovery all forms of both packaged and operational software the CSR includes a Vendor Software and Services index where the global attributes of software, such as vendor, description, and tags/categories are recorded. Packaged Software and Operational Software and Services may reference a Vendor Software and Service item to enable discovery of all forms of a component. 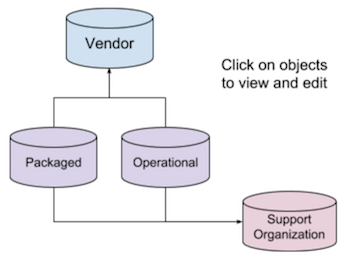 Support Organization information describes how to contact packaged or operational software support. Identify the component Support Organization and make sure it is registered. Identify the hosting cluster Resource or Science Gateway and make sure it is registered. If linking multiple forms of the same component is useful, identify the Vendor Software and Service component and make sure it is registered. Version: the software version, or the word "Latest" if you are providing pointers that will always reference the latest version of the software, or "NA" is this is for a hosted SaaS that is constantly changing. Execution Handle: enter the execution environment URI in the form "module:<module_name>" or "path:<path>"